2. If you’re an employed mother, push your children’s school to commit to dates in advance. It is not OK to tell you on Monday that the school play is on Thursday. Also, guilt is self-induced. Lose the guilt. 3. You get to choose what story you tell yourself and if the story you are currently using is stressing you out, change the story. 4. Focus 30% on goals and 70% on virtues. 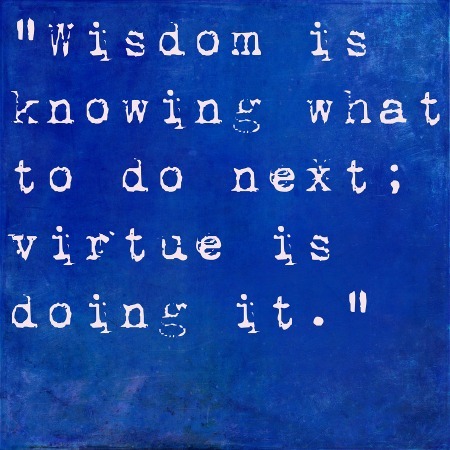 For example, here is a list of virtues compiled by Benjamin Franklin: temperance, silence, order, resolution, frugality, industry, sincerity, justice, moderation, cleanliness, tranquility, chastity, and humility. Ms. Bennington uses a similar list and the book includes instructions on how to personalize your own list. 6. Two tips about email: (1) Ignoring emails is rude, and (2) Don’t use email to settle disagreements. If conflict is involved, talk face-to-face. (For employees who telecommute, this must mean Skype or the telephone). 7. Don’t be petty and think because you worked two hours past 5 pm one day, you should come to work at 10:30 am the next day. 8. Make career advancement a priority. Schedule time to lead an internal committee, publish an article in your field, improve a process or system, make your LinkedIn profile 100% complete, and/or read industry newsletters and publications (including the ones read by your clients or customers). 9. Get to know your team. Ask them questions like, “Would you rather work with data, people, products, or ideas?” “How do you see yourself best contributing to the team?” “What really bugs you about this place?” The book includes 100 coaching questions from which to chose. 10. Be a magnificent woman first to have a magnificent career (not the other way around). You can be a leader and wield influence even before you have a specific title. Ms. Bennington says that the single best way to do this is to be someone who inspires others to connect with their own power. Over time, you will garner influence because others will view you as someone who will help them win. Which career advice tip is your favorite? Please comment below. I love #2: as a mom and business owner, I find the last-minute notices from schools very frustrating. I also deal with sports practice and game changes at the last minute. To avoid the “mom guilt”, I try to decide which events must have my presence and which will be ok to miss. Hint: Kids won’t even miss my presence at holiday parties.